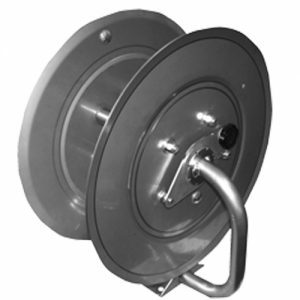 The Hydro Tek AR 326 Hose Reel has reel capacities of 250’ x 3/8”, 5000psi, 400° paired with another of the same. Ships quickly in 2 separate boxes, Made in the USA. 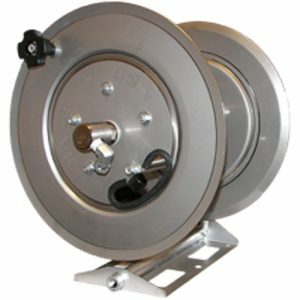 Hydro Tek Hose Reels can be mounted anywhere providing convenient and quick storage of both discharge and inlet hoses for your pressure washer. 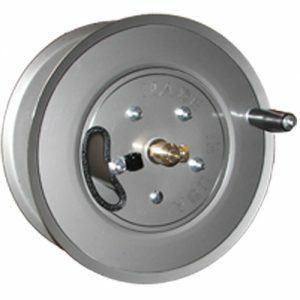 These pressure washer hose reels have the ability to swivel 180° allowing you to unroll the hose from any direction. When you are ready to travel simply reel the hose on to the drum with the provided handle, set the lock pin, and you’re ready to go. 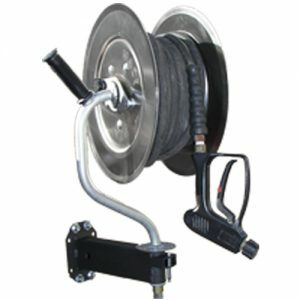 The Hydro Tek AR 425 features a stainless reel that has a capacity of 150’ x 3/8”, 5000psi, 400° and is designed to mount on tubing with the enclosed clamp, or can be mounted on a wall. 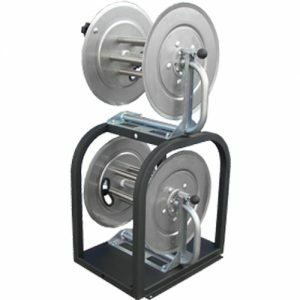 The reel has a friction brake for adjusting the drag depending on your job. It will pivot a full 360 degrees or you can slide the pin to lock the rotation where needed.